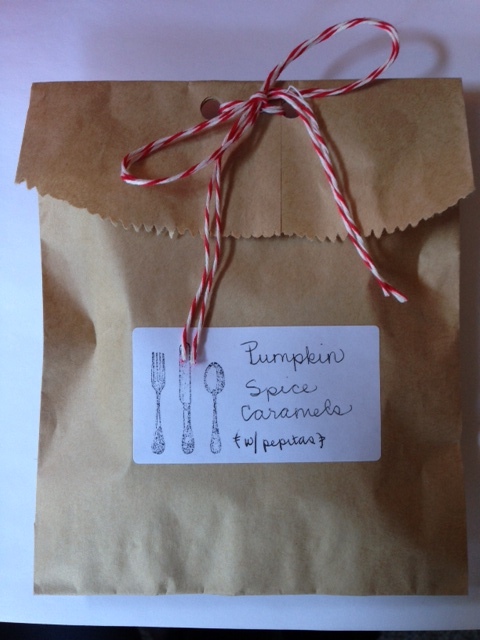 festive holiday recipe #7: pumpkin spice caramels — Mel bakes things. I have what you might call "a thing" for making caramels. The time and effort (which mostly consists of babysitting molten lava sugar) put into them makes them special, and homemade caramels taste so so SO much better than the store bought mass-produced kind. They also make the perfect gift. There is a candy shop near my apartment that makes their own passionfruit and raspberry caramels, and it got me thinking about how to incorporate some fall-like flavors into a caramel situation. The combination of the maple and pumpkin flavors, along with the spices, create a really well-rounded flavor that feels totally unique without being overwhelming. You can still eat 10 in a row without getting sick of them. The addition of the roasted pepitas (pumpkin seeds) provides a little bit of texture and crunch, although I don't think they're completely necessary to the overall flavor of the candy. The pepitas do give the caramels an interesting almost artsy look, though. For wrapping the individual caramels -- I happened to have some clear 4" x 4" cello wrappers leftover from another project, but typically I just cut my own 4" x 4" wrappers from parchment or wax paper (those would be the white-wrapped ones you see in the pictures). I wouldn't recommend using foil wrappers, though. They tend to stick. Like I said, you can package these for gifting in a number of ways: mason jars, cardboard take-out boxes, kraft paper bags, cellophane bags. I'm packaging mine up in brown kraft paper bags, and tying them up with bakers twine (see pic below) as little "welcome to Chicago" gifts for our Friendsgiving visitors. excuse the terrible pic, i forgot to take a legit photo of the packaging. Other caramels I've made: beer caramels & vanilla sea salt caramels. Dry toast the pepitas in a skillet, stirring or tossing occasionally, until they start to pop. Line the bottom and the sides of an 8-in square glass or metal pan with parchment. Evenly spread out the toasted pepitas on the bottom of the pan, on top of the parchment. As soon as it reaches the 240, pull it off the heat and stir in the butter and lemon juice. Stir vigorously (but be careful -- you're basically working with lava here..) so that butter is fully incorporated. Pour the mixture into the prepared pan, over the pepitas. Let cool 30 minutes and sprinkle the salt over the top. Let the caramels fully set (at least 2 hours) before using a hot knife to cut them into 1-inch squares and wrapping them individually in waxed paper. I prefer to let them set at room temp for a few hours, and then cover and pop them in the fridge for a couple more hours (sometimes overnight) before cutting and wrapping. These will last a while! If you're making ahead, just store them in the fridge until it's time to gift them.